Imagine getting right down on the field to capture sports action, zeroing in on your child’s expression on a crowded stage, and recording elusive wildlife shots. All this and more is possible with the Canon PowerShot SX50 HS 12MP Digital Camera offering the world’s first 50x Optical Zoom lens* in a compact digital camera, which goes all the way from a wide-angle 24mm to 1200mm (35mm equivalent) to capture any shot you choose. 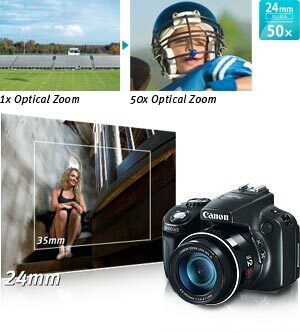 The PowerShot SX50 HS doesn’t just get you up close to the action, it delivers spectacular image quality to every shot. The Canon HS SYSTEM, a combination of a 12.1 Megapixel High-Sensitivity CMOS sensor and the DIGIC 5 Image Processor, achieves beautiful images up to ISO 6400. Record your memorable moments in incredibly lifelike 1080p Full HD video with stereo sound and High Speed AF ensures you’ll capture all the action with faster focusing speed and reduced shooting lag time. The PowerShot SX50 HS also features the additional benefit of Zoom Framing Assist Seek and Lock functions, for easy tracking of and keeping the subject centered in the frame until you capture the image. With powerful technologies that add convenience and advanced capabilities, PowerShot SX50 HS can help you capture more of life every day. * As of August 21, 2012. World’s first 50x Optical Zoom (24–1200mm) and 24mm Wide-Angle lens* with Optical Image Stabilizer delivers magnificent images whether you are up close or far away. Experience the difference that the ultra-zooming power of the PowerShot SX50 HS’s 24mm Wide-Angle 50x Optical Zoom lens can make on your everyday shooting. The extraordinary focal length of 4.3–215.0mm (35mm film equivalent: 24–1200mm) lets you capture everything from wide-angle shots to super-telephoto shots from wherever you are, while every shot exhibits the unique quality inherent to Canon optics. You’ll easily reach into sporting events from up in the bleachers, catch beautiful candid shots of your children without disrupting the scene, and achieve wildlife and landscape photography you never thought possible. Canon’s Optical Image Stabilizer ensures that whether up close or far away, every shot is clear and steady. It’s easy to track and capture subjects while using the extreme telephoto on the Canon PowerShot SX50 HS 12MP Digital Camera. Use the Zoom Framing Assist Seek function to locate and track your subjects even a long distance away; by simply pressing a button, this function remembers your previous zoom position, zooms out to let you locate your subject, and zooms right back into the saved position when you release the button. And with the Zoom Framing Assist Lock, the camera will lock onto and automatically track a subject, intelligently keeping them in the center of the frame until you’re ready to capture the perfect close-up shot. 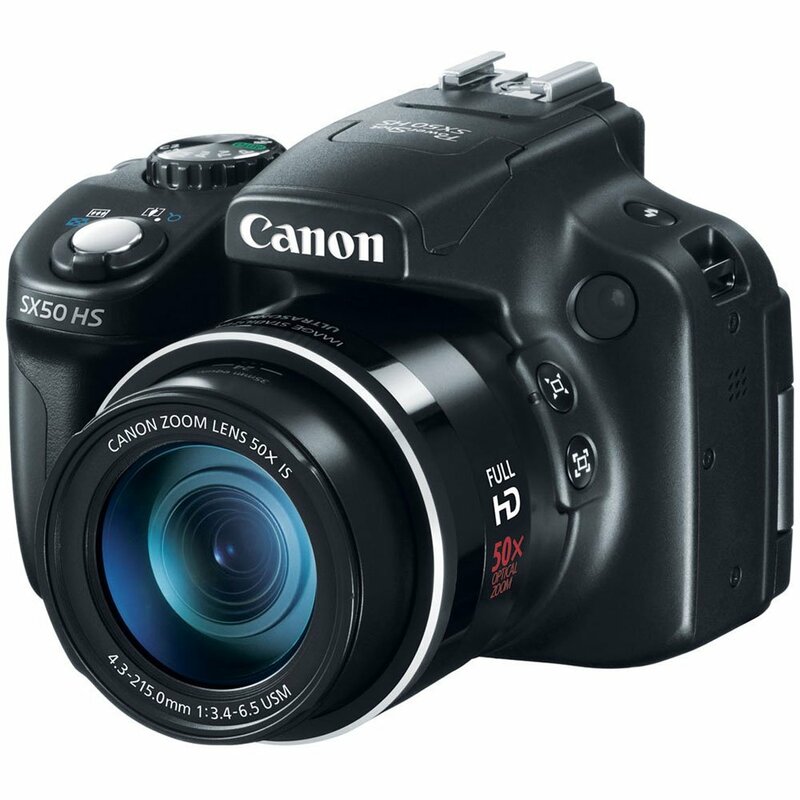 The PowerShot SX50 HS employs a Canon 12.1 Megapixel CMOS sensor, which delivers state-of-the-art imaging performance and is optimized for use in compact cameras. Utilizing a sophisticated light-capturing design, it provides high sensitivity for improved high ISO capture with reduced noise. It is also a high-speed design, capable of rapidly capturing and moving image data to the processor, enabling faster continuous shooting and faster autofocus. 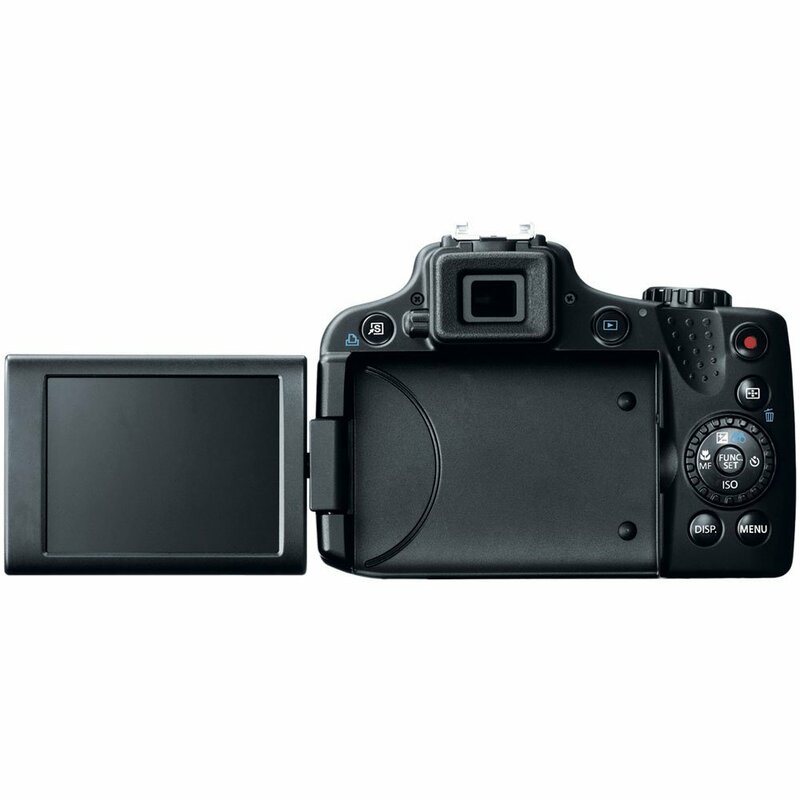 The latest-generation Canon DIGIC 5 Image Processor works with the PowerShot SX50 HS’s image sensor to bring phenomenal increases in processing speed and power, delivering incredible detail in more situations, without the need for artificial light sources. Improved noise reduction produces clearer images when shooting in low light at high ISO speeds. 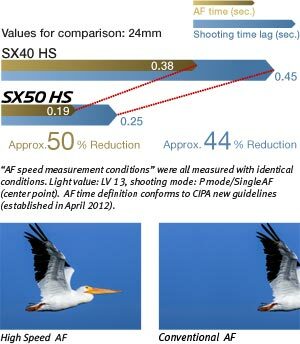 The faster processing speed results in faster continuous shooting capability while maintaining full image quality. With the power of the DIGIC 5 Image Processor, the PowerShot SX50 HS can achieve higher ISO sensitivity and even perform advanced functions like lens correction, special scene modes and much more. The Canon PowerShot SX50 HS 12MP Digital Camera gives you the power to create images with spectacular depth, detail and emotional resonance. The 12.1 Megapixel High-Sensitivity CMOS sensor works in concert with Canon’s latest-generation DIGIC 5 Image Processor to create the renowned Canon HS SYSTEM. With the Canon HS SYSTEM, you’ll experience excellent tracking performance even in low light, and achieve gorgeous still image quality even at high ISO speeds all the way up to ISO 6400; beautiful low-light shots are possible with minimal noise and maximum detail in highlight and shadow areas. The Canon HS SYSTEM lets you use higher shutter speeds to capture clearer images with reduced noise and blur in a variety of situations for incredible photos and even when shooting video. Capture stunning 1080p Full HD video in stereo sound with a dedicated movie button; zoom while shooting and play back videos on an HDTV via the HDMI output. Simply touch the dedicated movie button, now conveniently embedded in the PowerShot SX50 HS’s thumb pad, to start recording video in 1080p Full HD that is breathtakingly vivid and realistic. You’re free to use the full range of the zoom in movie mode, and sound is recorded in stereo. HDMI output allows you to view and share your video on an HDTV immediately, simply by connecting the camera to the TV with an optional HDMI cable. 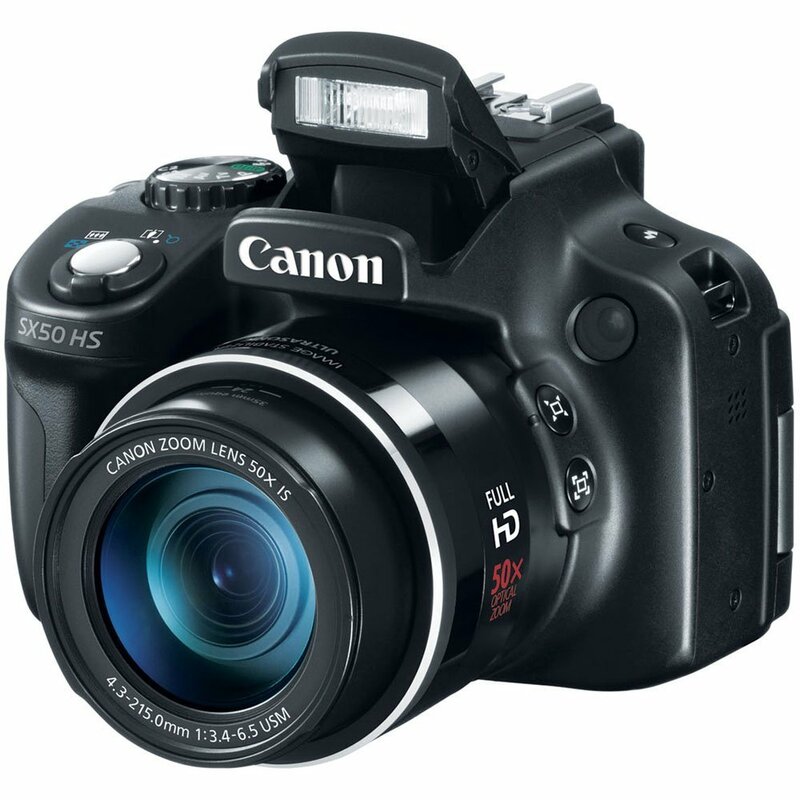 The Canon PowerShot SX50 HS 12MP Digital Camera is equipped with Canon’s latest advancement in AF technology: High Speed AF. The result of several improved technologies, High Speed AF delivers significantly faster focus speed of 0.19 seconds and a dramatically reduced shooting lag time of only 0.25 seconds, for a super-responsive shooting experience that lets you capture every great shot as it happens. The technology also powers the camera’s new High-Speed Burst HQ, with continuous capture at a maximum speed of approximately 13 fps. 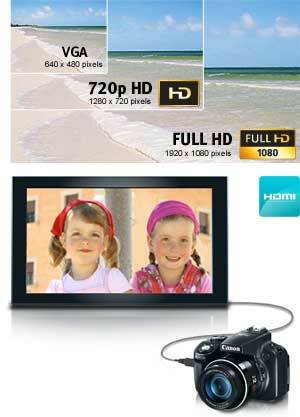 Moreover, images captured in High-Speed Burst HQ maintain the camera’s superb image quality. *The continuous shooting speed is approximately 13.0 fps. It’s easy to capture clear, steady images with the PowerShot SX50 HS, even in low light without using a tripod. That’s because the camera is equipped with Canon’s innovative Intelligent IS. The system analyzes camera movement and applies the best shake correction method for the shooting situation – allowing you to focus on framing and capturing your shot. For stills, the system automatically selects among Normal, Panning, Macro (Hybrid) and Tripod IS modes. When shooting video, the system automatically selects among Dynamic, Powered, Macro and Tripod IS modes. Dynamic IS has been enhanced to provide better performance than ever before, now compensating for rotational movement centered on the optical axis in addition to horizontal tilt and vertical pitch, for beautifully clear and steady video. 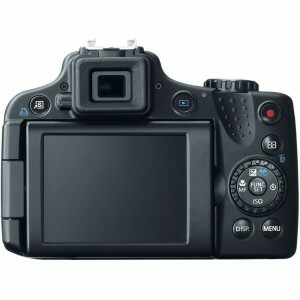 Bright 2.8-inch Vari-angle LCD with 461,000 dots for shooting at a variety of angles, plus an Electronic Viewfinder. 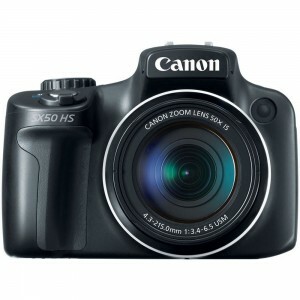 The PowerShot SX50 HS gives you lots of ways to frame a great shot. The bright 2.8-inch Vari-angle LCD has excellent resolution (approximately 461,000 dots), and flips out and swivels/rotates for shooting at unusual angles, even letting you capture perfectly framed self-portraits. 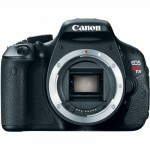 The camera also has an Electronic Viewfinder to give you the classic photographic experience. Smart AUTO intelligently selects the proper camera settings based on 58 predefined shooting situations and the Face ID function adjusts focus and exposure priority based on pre-registered faces. In Smart AUTO, the PowerShot SX50 HS analyzes various factors in the scene’s background and subject, then selects optimal camera settings based on predefined shooting situations to achieve the best possible image quality. The Smart AUTO function on PowerShot SX50 HS includes an astonishing 58 predefined shooting situations, giving you spectacular image quality in virtually any photographic conditions you’ll encounter. Canon’s futuristic Face ID feature allows you to register up to 12 faces on your camera, then gives those faces priority over others with regard to focus and exposure. As a result, even in group scenes, you’ll always get great shots of your children, family and friends. Define and store your own settings to achieve the effects you prefer. 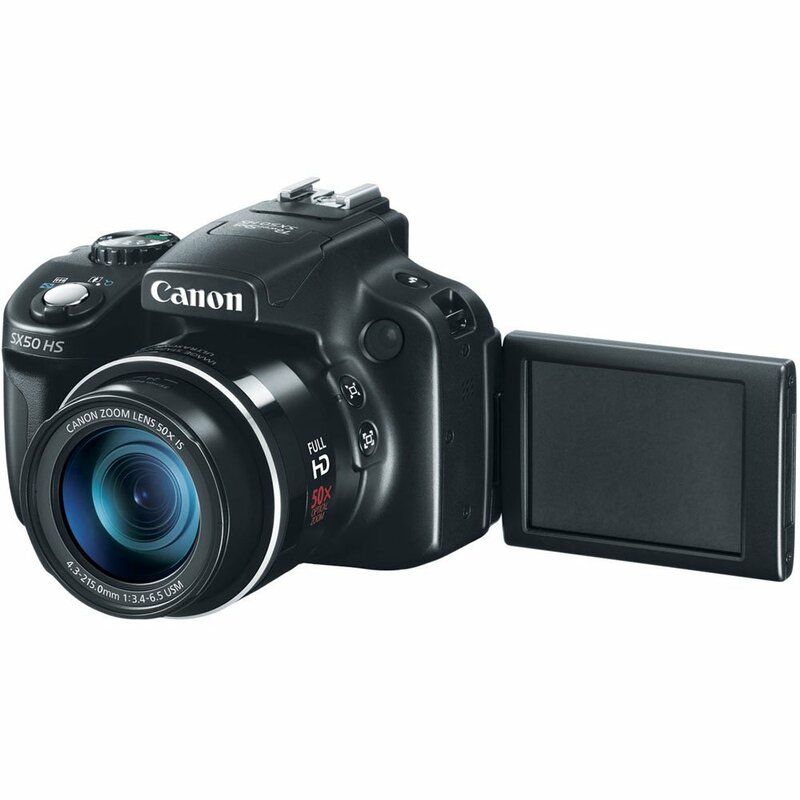 Captures fast-action shots at full sensor resolution, by shooting continuously when the shutter button is held down. Easy-to-use guidelines simplify the shooting of aligned multiple frames that can later be combined (using bundled software) to create panoramic photos. The camera combines three different exposures to get one evenly lit image. Create the look and feel of old photographs using sepia tones and black-and-white. Emphasizes perspectives for a miniature effect by blurring upper and bottom portions of the image. Creates a hazy ambiance that’s perfect for portraits and wedding photos. Full range of shooting and recording modes including RAW+JPEG for the ultimate creative control. As with many EOS DSLR cameras, the Canon PowerShot SX50 HS 12MP Digital Camera uses a 12-bit converter to process the output of the CMOS sensor, resulting in true color, smooth tonal transitions and natural gradations. The PowerShot SX50 HS lets you shoot in RAW mode, which records all the information captured by the sensor, giving you outstanding flexibility and complete creative control when editing your images with Canon’s powerful bundled software, and the camera allows you to record in RAW and JPEG formats simultaneously. Now in RAW mode, you can even select among several aspect ratios, including 16:9, 3:2, 4:3, 1:1, and 4:5. Built-in hot shoe allows compatibility with optional Speedlite flashes for additional lighting options. When you’re ready to take your creativity further with the lighting and exposure possibilities of an optional Canon Speedlite, the PowerShot SX50 HS is ready too. The camera has a built-in hot shoe that makes it compatible with a variety of Speedlite flashes. It’s quick and easy to make beautiful prints from your PowerShot camera with Canon’s Direct Print system. 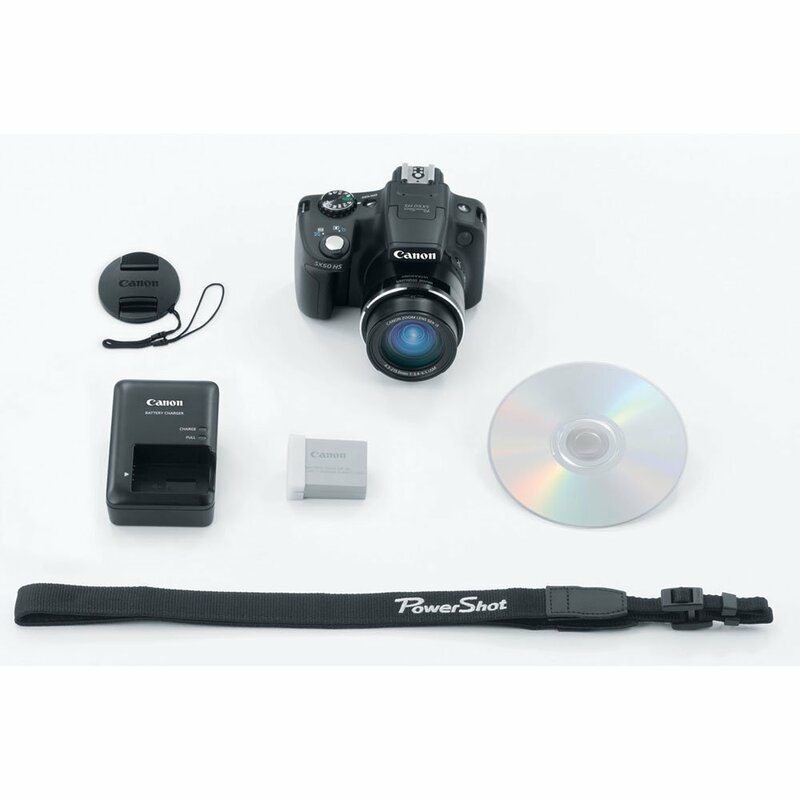 Directly connect your PowerShot camera to a Canon PIXMA or SELPHY photo printer with a USB cable (Sold separately) and simply press the button to print; turn every favorite moment into an amazing photo. PowerShot SX50 HS is world’s first 50x Optical Zoom lens in a compact digital camera, which goes all the way from a wide-angle 24mm to 1200mm (35mm equivalent) to capture any shot you choose. The PowerShot SX50 HS features the Canon HS SYSTEM, a combination of a 12.1 Megapixel High-Sensitivity CMOS sensor and the DIGIC 5 Image Processor, achieves beautiful images up to ISO 6400. Video recording is available at 1080p Full HD and High Speed AF ensures you’ll capture all the action with faster focusing speed and reduced shooting lag time. What’s in the box: Canon PowerShot SX50 HS 12MP Digital Camera, NB-10L Lithium-Ion Battery Pack for PowerShot SX40 HS, CB-2LC Battery Charger for NB-10L Battery for PowerShot SX40 HS, Neck Strap NS-DC11, Digital Camera Solution CD, Lens Cap with Strap and 1-Year Limited Warranty.